The Legislative Act of February 15, 1869, provided for the formation of the University of Nebraska, and included provision for a college of medicine. In 1883, the University of Nebraska College of Medicine was established at Lincoln. It continued in operation until the 1887 session of the Legislature withdrew its appropriation, necessitating discontinuance of the college on May 19, 1887. The Omaha Medical College, incorporated at Omaha in 1881, became a part of the University of Nebraska in 1902. The merger resulted in the first two years of the four year medical curriculum being given in Lincoln and the last two years in Omaha. Since 1913 the entire curriculum has been offered in Omaha. The College of Medicine is a component of the University of Nebraska Medical Center (UNMC), one of the four major campuses of the University of Nebraska System. At its October 1972 meeting, the Board of Regents of the University established the School of Allied Health Professions (SAHP) as a formal entity of the College of Medicine on the Medical Center Campus. Thirty-six years later, on September, 25, 2008, all the programs in the SAHP finally came together in one building when the renovation of Bennett Hall (built in 1918) was complete. Since its inception in 1972, the School of Allied Health Professions grew considerably in the depth, breadth and geographical reach of its educational programs. It dramatically enhanced extramural funding, including the addition of numerous endowed faculty and chair positions, and expanded the scope of faculty involvement and responsibility across UNMC, and at national levels of leadership within professional organizations. 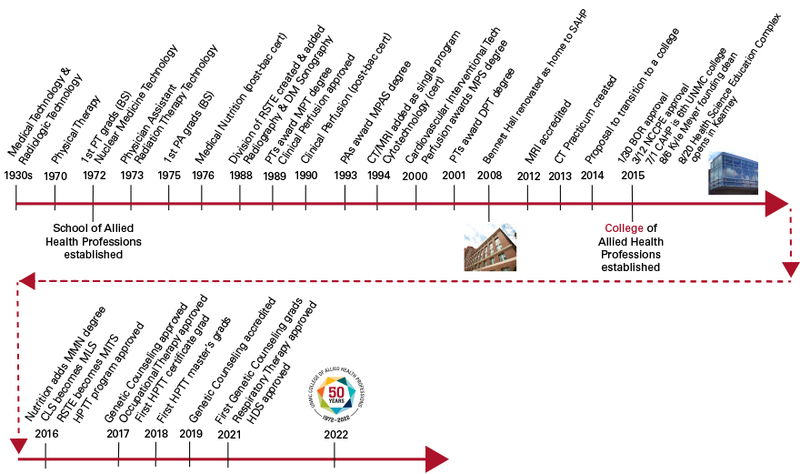 In response to this growth, in the fall of 2014 UNMC put forth a proposal requesting approval to transition the School of Allied Health Professions to a free-standing college. On January 30, 2015 the University of Nebraska Board of Regents unanimously approved the proposal. This was followed by unanimous approval on March 12, 2015 by the Nebraska Coordinating Commission for Postsecondary Education. On July 1, 2015, the former School of Allied Health Professions became the UNMC’s sixth college – the College of Allied Health Professions. On August 6, 2015, University of Nebraska Board of Regents approved the appointment of Kyle Meyer, Ph.D., as founding dean of the University of Nebraska Medical Center's College of Allied Health Professions. UNMC has been engaged in the education of allied health personnel for five decades. It began in the early 1930s with a class in Medical Technology and a class in Radiologic Technology. A Bachelor of Science degree program in Physical Therapy Education was established in 1970. In 1989 it was replaced by the Master of Physical Therapy program and again in 2001 with a Doctorate of Physical Therapy program. The Nuclear Medicine Technology program was established in 1972 followed by the Radiation Therapy Technology program in 1973. The Physician Assistant baccalaureate degree program was also established in 1973 and was replaced in 1993 by the Master of Physician Assistant Studies. In addition to these formal degree programs, a post-baccalaureate generalist dietetic internship program was initiated in 1976 to provide experiences in clinical, administrative, community and consulting dietetics. At its March 1988 meeting, the Board of Regents of the University approved the Division of Radiation Science Technology Education, which incorporated the training of Radiographers, Nuclear Medicine Technologists, Radiation Therapy Technologists, and Diagnostic Medical Sonographers into one Bachelor of Science degree in Radiation Science Technology Education. Approval was obtained at the October 1989 meeting of the Board of Regents to establish a Clinical Perfusion Education Program within the SAHP. This new program admitted its first students in August 1990 and awarded a post-baccalaureate certificate upon completion of the 21-month training program. In May 2000, this certificate program was replaced by a Masters in Clinical Perfusion. A certificate program in Cytotechnology was approved by the Board of Regents in 1994. This program admitted its first student in August of 1994. Computed Tomography (CT) / Magnetic Resonance Imaging (MRI) education began in 1994, and the Cardiovascular Interventional Technology program started in 2000. MRI received JRCERT accreditation status in May of 2012, and MRI and CT separated in 2013 with CT changing to a practicum.